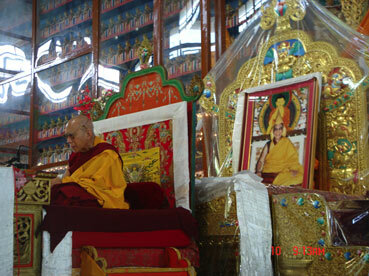 Lati Rinpoche giving Teachings in Southern India. The Geden Phacho Bhucho Project is very grateful to Lati Rinpoche for accepting to give these rare and precious teachings. The Geden Phacho Bhucho Project is very grateful that Lati Rinpoche (87) has accepted to give these very rare & Precious Teachings. The Ten day program was seperated into four sets of Teachings. 1/ Gathered Teachings of White Tara Activities. 2/ Two Stages of Tantric Practice on Chitamani Deity.